We’re just finishing up our third stay at Wilmington, Ohio Thousand Trails. Since I’ve already done a couple of reviews of this campground this installment is just a quick wrap up. Our 2013 Review is here. Our 2015 Review is here. We were happy to find a nice spot in Loop A, arriving just ahead of the busy Memorial Day weekend. The place quickly filled up, including most of the seasonal sites, many of which had family and friends as guests. We got a kick out of watching the kids coast down the nearby paved road on scooters and bikes. They were having such a good time that it was fun to watch them. The campground staff pulled out all the stops in planning activities for all. We enjoyed a free member-appreciation cookout and special music at the campground church service on Sunday. 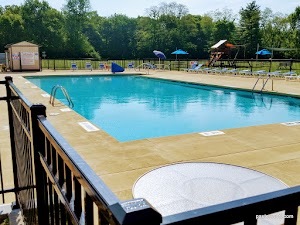 One big change to the campground since our last visit was a complete remodel of the pool area. It looks very good and got a lot of use on its opening day weekend. We made some new friends, most of whom happen to seasonal site holders. We also enjoyed getting to know some previously Facebook only friends: David and Judy Evans who came in during our second week here. One disappointment to us was our visit to the nearby gas station/convenience store where we had enjoyed soft serve chocolate ice cream on our previous visits. They no longer have soft serve. We were rather bummed out about that! All in all, while we’d rather be out exploring new places, we’ve enjoyed our third stay here and rank Wilmington Thousand Trails in the top third of the Thousand Trails we’ve visited. This was our second stay at Wilmington, OH Thousand Trails. We were here over two years ago and, in fact, stayed in a site just down the road from where we stayed this time. Our first stay, though, was a rather wet and stormy one. This time, we’ve enjoyed ideal weather. We still like this place and now that we’ve stayed in so many Thousand Trails I think we can say that this one is above average. Our 2017 Review is here. The common Thousand Trails issue of many of the more desirable sites being rented out to long term residents is in play here. I think it’s kind of sad that there are so many nice sites with empty trailers sitting on them while traveling members have just a few spots to pick from. This is nothing against people who take advantage of the deal but I do wish more consideration was given to regular members. We’ve enjoyed the company of our good friends Ron and Theresa Corwin. They are traveling from the east and we are traveling from the north and we met here for these two weeks. Ron willingly took on some projects on our camper and for that I am very grateful. We also enjoyed lots of fun fellowship with them during our stay. To make things even better, Jackie’s brother Jim, and his wife, Phyllis came to visit her mother who lives nearby. It was lots of fun to spend time with them. This is a quiet campground – a nice place for leisurely walks and evening campfires. We also enjoyed a concert by the Weaver Believer band. Since we did a review of this campground with lots of photos and some of the area sights, especially our time at the National Museum of the Air Force, on our previous visit I’ll not repeat the same information here but I will mention that I’ve added some photos to the campground photo album. We do like this campground and expect to return for future visits. 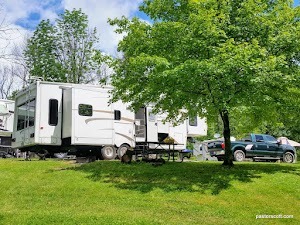 Ottawa Metro Park Campground is a nice campground located just a few minutes off of I75 in Lima, Ohio, making it a great two night stop for us. The roads and the spacious, level campsites are paved. There are both back in and pull-through sites. The trees in the campground are smaller, so they don’t offer much shade but, as a result of their size, getting satellite TV is no problem. Some sites offer 50 amp electric but the majority are 30 amp. All sites are water/electric and there is a dump station in the campground. The restroom/shower building is modern and clean. During our stay the price was $25 a night with an over-60 senior discount price of $20. There are some terrific, paved walking trails and a swimming beach in the park. The only negative I saw about the campground is that it’s all first-come/first-served with no reservations possible. For RVers out on the road this arraignment doesn’t work very well. We arrived the weekend after Labor Day and had no problem getting a site. 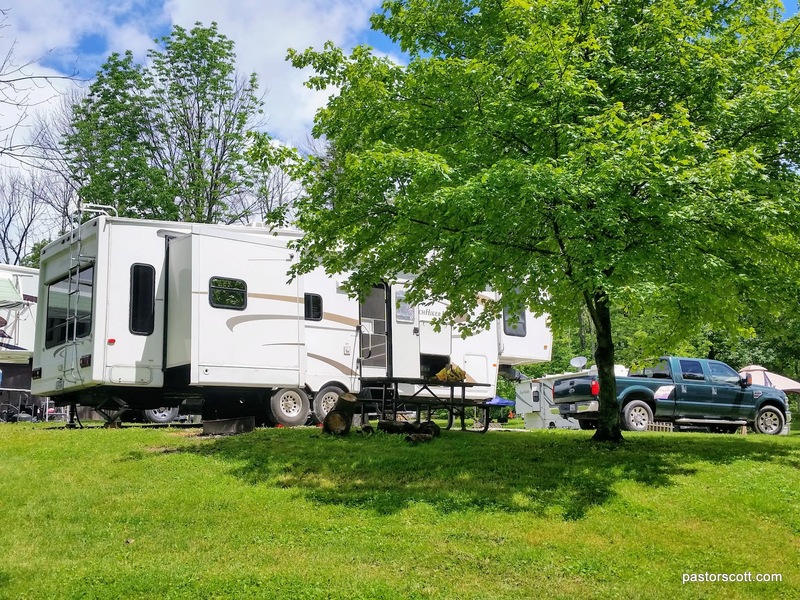 If you plan on coming to this park during busier times, you might want to try arriving on a weeknight; or at least you will want to have a backup campground in mind. My Verizon 4G signal was a usable 2 bars. This place is a real winner, especially if you don’t mind taking a chance on getting a site when traveling during busy times of the year.